There’s not been much to see since St Petersburg, once you get past the autumn colours of the trees and the fjords. It’s very nice, but a bit samey after 1300kms! I decided this morning I’d push on and try and get to Murmansk. It was just over 600km, so quite doable. The only minor problem was that as I lay in my hammock this morning it was raining. I don’t mind if it rains while I’m on the move, but going out in it is a different matter altogether!! I got moving though and after about 250 km it cleared up. The sky was grey and it felt colder than it was, the temperature even got to double figures for half an hour! The last 200 km were good fun, the road drying out and the long straights giving way to sweeping bends. 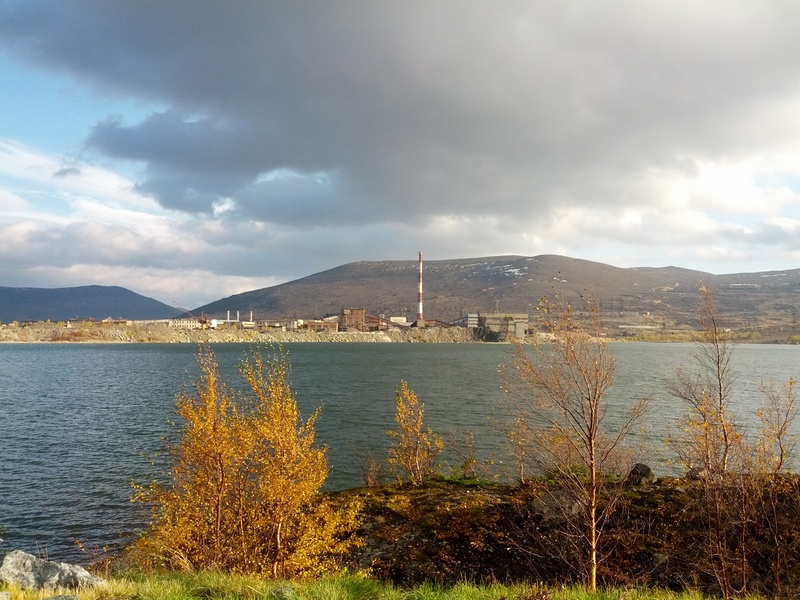 There was a small mountain range just prior to Murmansk, I wasn’t expecting that at all. It thought I’d be at sea level all day. I stopped to take a picture of this power station (I think that’s what it is), because it looked cool. If I had a better camera it would make a cracking HDR. Anyway, you get the idea. And yes, that is snow on the hill!